At the distant beginning of Western civilization, according to European tradition, Greece stands as an insular, isolated, near-miracle of burgeoning culture. This book traverses the ancient world's three great centers of cultural exchange--Babylonian Nineveh, Egyptian Memphis, and Iranian Persepolis--to situate classical Greece in its proper historical place, at the Western margin of a more comprehensive Near Eastern-Aegean cultural community that emerged in the Bronze Age and expanded westward in the first millennium B.C. 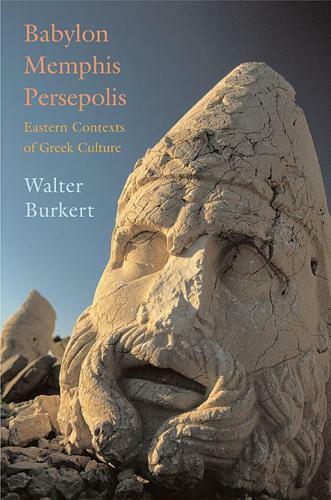 In concise and inviting fashion, Walter Burkert lays out the essential evidence for this ongoing reinterpretation of Greek culture. In particular, he points to the critical role of the development of writing in the ancient Near East, from the achievement of cuneiform in the Bronze Age to the rise of the alphabet after 1000 B.C. From the invention and diffusion of alphabetic writing, a series of cultural encounters between "Oriental" and Greek followed. Burkert details how the Assyrian influences of Phoenician and Anatolian intermediaries, the emerging fascination with Egypt, and the Persian conquests in Ionia make themselves felt in the poetry of Homer and his gods, in the mythic foundations of Greek cults, and in the first steps toward philosophy. A journey through the fluid borderlines of the Near East and Europe, with new and shifting perspectives on the cultural exchanges these produced, this book offers a clear view of the multicultural field upon which the Greek heritage that formed Western civilization first appeared.